The ultimate solution to brawls that break instantly or turn into real fights. Compatible with any mod. Do whatever you want with this file. It is more effective if more people use it! Just credit me. - Removed a rogue OnMagicEffectApply event that could cause the fight to end due to magic use. - This will also fix the vanilla bug that cancels the fight if you use an enchanted weapon. - Using hostile magic during a brawl no longer cancels and escalates the brawl unless you actually hit the opponent with it. This improves consistency with vanilla behaviour. Non-hostile magic will still count as a defeat and cancel the brawl without escalating it. Note: Flamestrike in Apocalypse is actually a self buff and considered non-hostile until the meteors strike, so this one offensive spell will make you lose the brawl even if you don't hit the opponent with it. Then again, why are you casting Flamestrike during a brawl and not even aiming for anything? - The brawl will now be cancelled when the player casts any spell from their hands (autocast spells are exempt) or uses alchemy. This will trigger the "not so tough now, are you?" defeat scene unless the spell is hostile, in which case it will trigger the "you want a real fight, eh?" escalation scene. - Eliminated a redundant check to see if the player is hit by a scroll from a third party, which can't happen. Skyrim Special Edition version available here. Support Enai Siaion on Patreon! "You want a real fight, eh?" Brawls are poorly implemented in Skyrim. Any magic effects applied to either participant will cancel the brawl and may cause the opponent to pull out their weapon. Depending on your load order, you may experience the infamous "Brawl Bug" that prevents you from completing any brawls. Most people are familiar with the popular Brawl Bugs Patch. Unfortunately, it is several years old and some users are still suffering from the brawl bug anyway due to several errors in its implementation. It also has the potential to generate significant script load. Because its permissions do not allow redistribution, I made an improved fix from scratch. This mod replaces the Brawl Bugs Patch. You can safely update from it to the Modern Brawl Bug Fix. The Modern Brawl Bug Fix updates the following 9 scripts. In the vanilla game, brawls (and certain other controlled combat scenarios) are cancelled when either participant is struck by a magic effect. 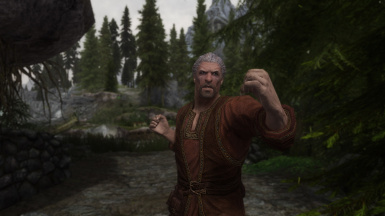 This mod updates these events to trigger only when a participant is struck by a weapon (except fists), hostile spell, shout or scroll or (added in version 1.02) when the player casts a spell, uses an ingredient or uses a potion during the brawl. "This mod overwrites files from mod X, is it compatible?" Most of my other mods (Imperious, Ordinator, Wildcat, Apocalypse, Sacrosanct, etc) come with a copy of the Modern Brawl Bug Fix. Those files are identical to the ones in this mod. The Modern Brawl Bug Fix comes with a "Resources" folder that contains the source scripts. Feel free to distribute them with your own mods!